I'll start this by saying that I'm not sure why it's called a "wild" potato salad. Now let's go back to the beginning of the story... it's a very good place to start. I bought a bag of small 'new' potatoes at my local supermarket the other day. I was cooking some salmon fillets for dinner and thought they'd go well with some crushed garlic and olive oil. When I opened the bag I found a "wild" potato salad recipe on the back of the bag. All of the ingredients sounded quite nice, so I decided to give it a try. Admittedly, I didn't have some of the ingredients on the original recipe, so I tweaked it a little with what I already had at home in the refrigerator, garden and the pantry. 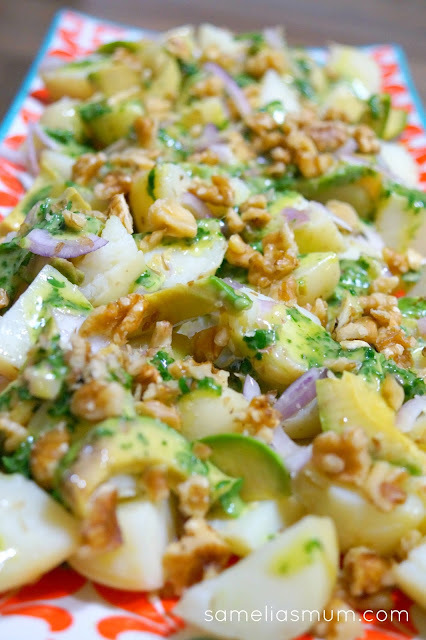 This potato salad was a winner! Everyone in the family loved it - even though there was some negotiation to get the kids to try it in the first place. It might have something to do with the green sauce. If you make this salad, let me know what you think. Also, suggestions for a new, more apt name would also be appreciated. 1. Boil the potatoes in a large saucepan until just tender. Drain and allow them to cool a little. 2. Meanwhile, combine the parsley, dijon mustard, mayonnaise, vinegar, honey and half of the olive oil using a food processor (or stick blender, bullet, thermo - what ever you have to blitz it all up). 3. Cut the potatoes into quarters and arrange them on a platter. Drizzle the remaining olive oil over the potatoes with a light sprinkle of salt. 4. 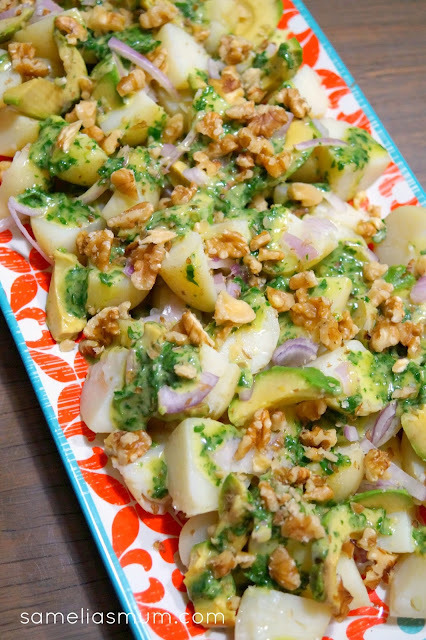 Add the avocado on top of the potatoes along with the sliced onion. 5. Pour the dressing over the top. 6. Top with the chopped walnuts. Serve while the potatoes are still warm. YUM!! Do you try the recipes on the back of the packaging? Have you come across any family favourites this way? What's your favourite way to eat potatoes? Will be giving this a go soon, Anorina - it looks and sound delicious. 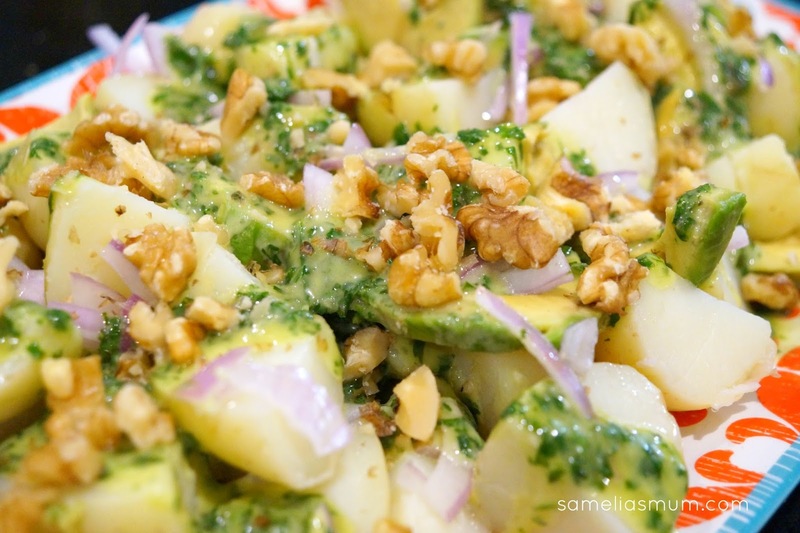 Nice to have a new recipe for a non-boring side dish - thanks!